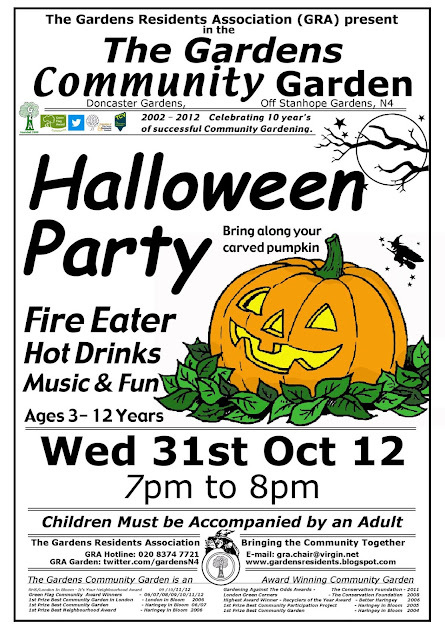 On 29th September 2012 we celebrate 10 years of community volunteering in the Gardens. The Gardens’ Community Garden opened on 14th September 2002, an amazing achievement by local residents and the residents association, the GRA have worked hard to create & maintain this pocket oasis for all. The site of the Community Garden used to be an entrance road way to the once famous Harringay Stadium, which following years of disrepair, was eventually demolished and redeveloped as Sainsbury’s circa 1987, sadly with no one to take ownership of the strip of land and railway arch at the end of Doncaster Gardens. This caused serious problems with vandalism, trespassing, dumping and maintenance issues to local residents, Haringey Council and the railway company. 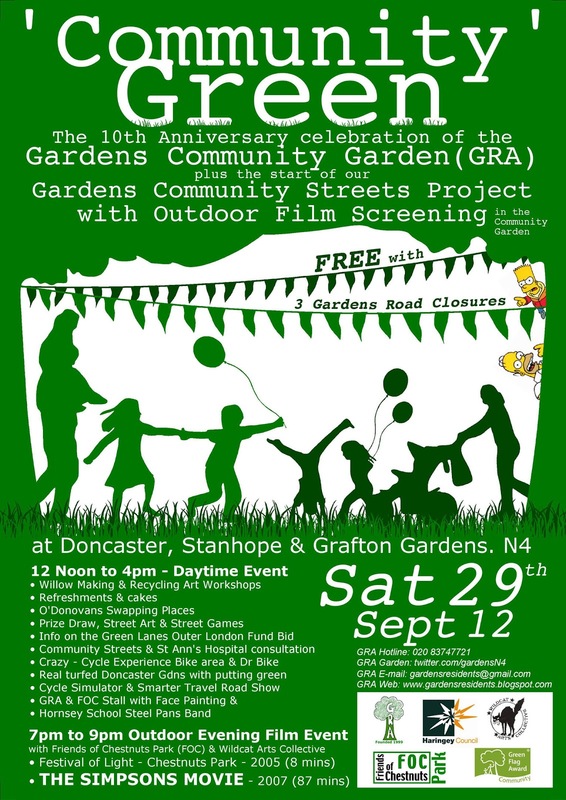 Formed in 1999, the Gardens Residents Association (GRA) through a series of consultations, conceived the idea of securing the land, designing, fundraising and building the community garden for everyone to enjoy. Now ten years on, with 20 local and national awards to date and many fantastic events behind us, the space has truly become a ‘”Community Centre Without A Roof” , “The Oasis of the Gardens”. We would like to thank all the funders for initially funding the Gardens, Network Rail (our landlord), our local three St Ann’s Ward councillors and Haringey Parks Dept who have supported us along the way, without their support we would have had to close the gates years ago. And a very special thank you to all our garden and event volunteers. The only way the garden works is by people being involved and keeping it open and growing, driven through the residents association. Without regular income from volunteer’s activities and events, the garden would certainly not be here. So here is to 10 years more of great memories and gardening for young and old being created in the Community Gardens. With funding in place for the Community Streets Project, we have fantastic future for our streets and “ the Gardens”, with your involvement we have a fantastic future for the Gardens Area. FOC who are funding the evenings film event, are very pleased to be working with the GRA and supporting the Community Gardens 10th Anniversary event. Friends of Chestnuts Park have worked hard for many years and campaigns for improvements to our local park. Recent successes include transforming the playground area and development of the senorary play area and Multi sports play space. We have lots of ideas for what needs to happen next in the park. What are your ideas?. There are challenges ahead with cuts in the Parks Services so there is never been a better time to get involved. We meet every two months on the third Saturday of the month in the park café. The next meeting is 11am Sat 18th Nov 12. Most meetings include a practical planting session or other activity. WAC is delighted to be working in partnership again with the GRA’s Community Garden. WAC organizes cultural/arts events around comedy, music, poetry, dance and film/outdoor screenings. These events, aimed at three groups: children (Kids Collective), younger teenagers (11PLUS) & Parents / Carers, they are affordable, progressive and inclusive. We are open to new ideas & projects & like to make links with other community groups. We are always looking for people to get involved. 2007, USA, 87mins.Director, David Silverman. The locals' casual disregard for the environment leads to Springfield being sealed off from the outside world - not even Greenday can make a difference. The Simpsons Movie is right up there with the classic TV episodes such as 'Radio Bart', 'Homer Badman' and 'Flaming Moe's'. Very, very funny and genuinely cinematic - a rare opportunity to see this film outdoors on a big screen, with communal laughter ringing in your ears (and you get to see Bart's doodle, too!). Kurdish Community Centre in Portland Gardens. improve where we all live, or just to find out more. matters that directly relate to the Gardens area. Lanes between Endymion Rd and Ducketts Common. work on the railway bridge. so hard on this and other projects over the last 10 years. projection onto the Salisbury Pub (picture left). attending a prestigious awards ceremony in March. voluntary run green spaces and gardens in the UK. come along and help us win again for 2012.
starting to plan the 10th anniversary party for this occasion. maintenance morning to find out more. enforcement of planning and licensing laws. of the wider community to inform decision-making. for further public consultation in spring 2012.
look attractive and green for residents to enjoy. arrange the collection from your house or flat.